This makes a great side or a meal. It's light and easy; yet, still substantial enough to keep you full for a little while. Remember to eat every 2-3 hours to keep the hunger at bay. For more nutrition advice, check out my 10 day Jump Start Nutrition Group for weight loss, support, accountability, and more! In a large bowl combine olive oil, vinegar, sesame oil, spices and sweetener. 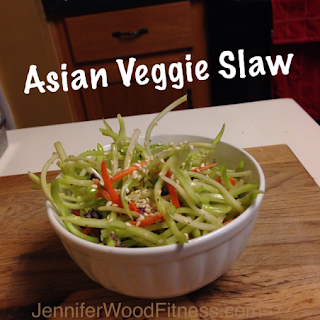 Add in coleslaw veggies and stir well. Toast sesame seeds on the stove for a few minutes. Top coleslaw with sesame seeds and enjoy! *Would be great alone as a snack or add some grilled chicken for a healthy lunch or dinner. For more great recipes, lots of fun, fitness tips, nutrition advice and more!